Bob had a lot of things going on on Saturday and so I coerced Ashley and Eric to come to JC and play in the snow with me! We finally had a heavy, wet snow that was perfect for snowmen and sleighing! We don't own a sled (I think I will put it on our Christmas list for next year) and tried a variety of things to try to go down our hill but nothing really worked. We really had a good laugh at our efforts! The snowman was fun to make. Eric did the heavy work so that Ashley and I did not hurt our backs. Thank goodness for a strong guy! We had the dogs outside, too and I think they enjoyed being out in the snow too! 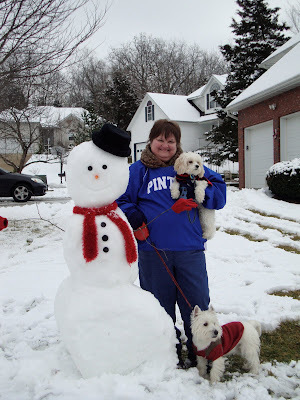 That's a beautiful picture of you and your dogs in the snow with the snowman Terri. Looks like you, Ashley and Eric had a lot of laughs. Thank you for sharing such cute images this morning. Enjoy your day. Oh, I can just picture you all trying to slide on that heavy wet snow ~~~ not! Your snowman is so cute, all he needs is a snowdog to keep him company! Oh, that looks like fun, Terri. Cute, cute snowman! Now...I heard you say that you are headed for surgery? I do pray that you will be ok and that the Doc's hands will be guided. And i am thrilled to have found you! You're such a kid! Love it, love it, love it! Looks as if you all had fun. What was Ashley using there? A cookie sheet? We find that flattened cardboard boxes work best in a pinch. Hi sweet friend! I've finally found some "me" time and I'm enjoying visiting my blog friends. Oh, what fun! And your snowman is adorable! Eric did an excellent job. Hi Terri, we have used big green garbage bags for sledding too! Love your pictures! That's one cute snowman!